Remi is a geometric monospace sans-serif, with five weights, two sets of capitals and plenty of OpenType features intended for display typography but with its true italics and various features designed specifically for text setting, its usage possibilities are wide. The construction and the proportions are based on the classic segmented LCD fonts: the capitals are the same height as the ascender and the x-height is exactly in the middle of the capital height. For this reason, another set of ‘shorter’ capitals was added. 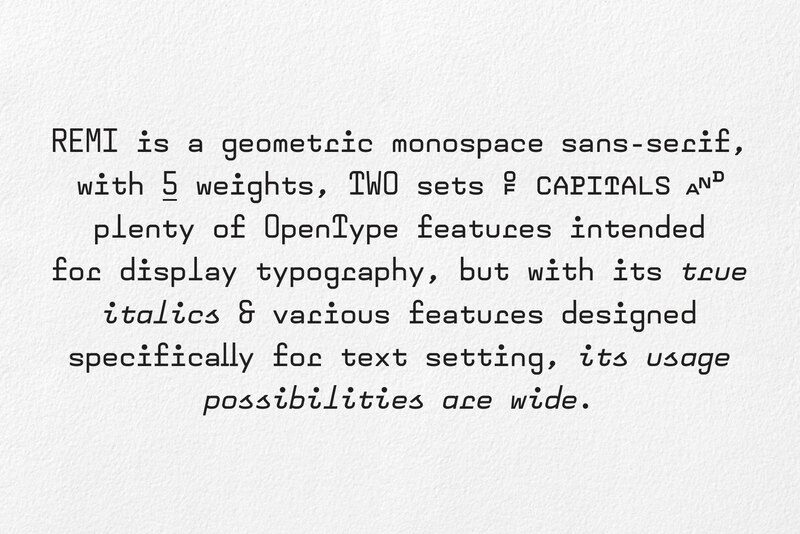 They can be used as ordinary small capitals or as short capitals via the Stylistic Set 1 OpenType feature. The fonts have more than 40 special ligatures: compound glyphs containing abbreviations of both imperial and metric measurement units as well as some frequent short words from five major languages. The name Remi isn’t in any way connected to the old American typewriter manufacturer Remington. The name was chosen simply because it sounded and looked just right. Remi is available in five feature-rich weights in Roman and Italic.